Most of students start to do study at the time of exam means before 15 or 1 month & under stress they don’t complete whole syllabus so they don’t score good in the exam & their effect is on their future. 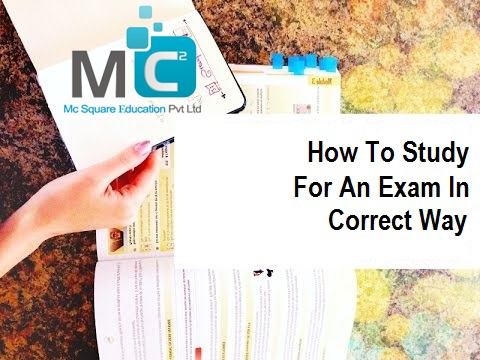 So students Mc2 Academy provide you some tips which is beneficial for your final exams & your future. First of all you have to know the syllabus & exam pattern of the exam that you have prepare. So students according mark weightage you have to give priority for that chapter. Through previous year question paper you know what types of questions are asked in the exam. The main thing is that you have to clear all basic so it is beneficial to understand further concepts. If your basics are perfect then you remember its long time. While doing study make notes, highlight the important information & note down all formulae on one paper sheet. This will help you to memories all the things at the time of exam. Proper plan proper execution. You make a timetable & follow it in any situation. If according to timetable you do study then surely you get success without any stress. So proper planning helps you to know how much study you done & how much it remains. If you are confident on yourself then you can achieve everything that you want. It is very important to eat healthy diet. Diet plays an important role in your success. Don’t eat more junk food instead of that eats fresh fruits, vegetables, food. Avoid stale food. For keeping your health good daily do yoga, some exercise that helps to keep your mind calm. A good sleep is also very important it helps to stimulate your memory & increase attention power. If you have any further doubts regarding competitive exams like NEET UG, CSIR NET, IIT JAM, SET exam then contact with us. Mc2 Academy provides best coaching classes for this exam.